These simulations require the repeated computation of solutions of a particular linear system encoding a partial differential equation. The matrix involved is extremely sparse, i.e. the number of non-zero elements increases only linearly with the matrix dimension (and thus do the flops). This extremely sparse system is most effectively solved by means of a multi-grid method (MG), which combines a generic solver (Krylov, FGMRES, multiplicative Schwartz) with another solver on a coarsened grid (lattice). Here, the generic method effectively reduces the errors of the approximate solution on the subspace of medium to large eigenvalues, whereas the coarse grid method is effective on the space of low eigenvalues of the matrix (which is well approximated on the coarser grid). The combination of different formulations of Lattice QCD (discretizations such as Wilson or staggered fermions) and the different flavors of MG methods as well as target architectures opens a large space of possibilities for a student to explore looking for the optimal matching between methods and machines. In the former case, the student can select among different target architectures, ranging from Intel XeonPhi, Haswell (AVX2) or GPUs (OpenPOWER), which are available at the institute. To that end, he/she will benchmark the method and identify the relevant kernels. He/she will analyse the performance of the kernels, identify performance bottlenecks, and develop strategies to solve these – if possible taking similarities between the target architectures (such as SIMD vectors) into account. He/she will optimize the kernels and document the steps taken in the optimization as well as the performance results achieved. In the latter case, the student will, after familiarizing himself with the architectures, explore different methods by implementing them or using those that have either already been implemented. He/she will explore how the algorithmic properties match the hardware capabilities. He/she will test the archived total performance, and study bottlenecks e.g. using profiling tools. He/she will then test the method at different scales and document the findings. The first picture is of promotional nature and was used to symbolize the research group on posters. 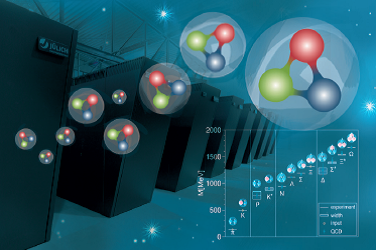 It shows a supercomputer, a research result (Light Hadron Spectrum, Science 322, (2008) 1224) and symbolic pictures of protons. The student will familiarize himself with important new HPC architectures, Intel Xeon Phi, Haswell, and OpenPOWER. He/she will learn how the hardware functions on a low level and use this knowledge to optimize software. He/she will use state-of-the art benchmarking tools to achieve optimal performance for the kernels found to be relevant in the application. Week 8: Generating of final performance results. Preparation of plots/figures. Submission of results. A) Different kernels require different levels of understanding of the hardware and of optimization strategies. For example it may or may not be required to optimize memory access patterns to improve cache utilization. A particularly able student may work on such a kernel. ‹ Shape up or ship out – You decide! 1 Pings/Trackbacks for "Phine quarks and cude gluons"